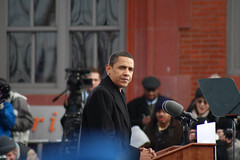 This is a striking image I snapped during the Whistle Stop tour on 1/17/2009 in Wilmington Delaware. Geesh!! He's lookin me dead in the eye . You can click on the image to feel the full impact as well. This image will be made available on my Gallery at ImageKind shortly. In the meantime, feel free to browse other pieces of mine, including some of the President elect. Excellant job putting the watermark on there. I was wondering what was up with his face until I looked closer.